I was born and raised within a rural town in New England. A place where public transit is virtually nonexistent and the primary mode of transportation is via automobiles. Traveling to the nearest grocery market, one finds themselves on a short pilgrimage— driving down long windy country roads whose sides are lined with trees and tall wooden fences as far as the eye can see. Last week I decided I needed to step away from technology with a screen and take a drive to do a bit of meditation in the backroads of Massachusetts. Turning up my radio and gliding through the smooth roads under a canopy of tall vegetation always clears my head and recharges me. As I was cruising around in my car singing to the radio and plotting to take over the world, I was abruptly interrupted with a loud “THUD.” Then silence for a few seconds and then another, “THUD THUD THUD.” The smooth road I was driving on had suddenly become littered with cracks. Small ones, long ones, wide ones and thin ones. Every few meters I hit another! My calm had vanished and now I was breaking a sweat—just trying to avoid the cracks to save my muffler from falling off my car. For the next few hours I was irritated. My wondrous journey was interrupted and all I could think about from my travels that day was the turbulence that derailed me. Design is no different than traveling down a long road. A user may go through a flow within a product or experience some channels of marketing that are exceptionally composed. But the minute something goes wrong it has the tendency to bring down the entire experience for that user. Unfortunately, many humans focus on the negative aspects of things. Fifty experiences may be fantastic, but if the fifty first is bad, that’s where the overall judgement will fall. As designers, it’s paramount for us to maintain a high level of consistency and continuously re-evaluate our product and marketing. As we develop new products and features, we have to look back to ensure they tie into everything we’ve created in the pas. Of course, at a distributed company like Automattic, its easy for cracks to appear on our roads since disconnects can form between teams working on different features or products. Extra care must be taken within our communication methods in order to pre-emptively avoid any disconnects between various product and feature functionality. The diagram above shows the possibility of what could easily happen within the Jetpack and WorldPress.com ecosystem when features are released. 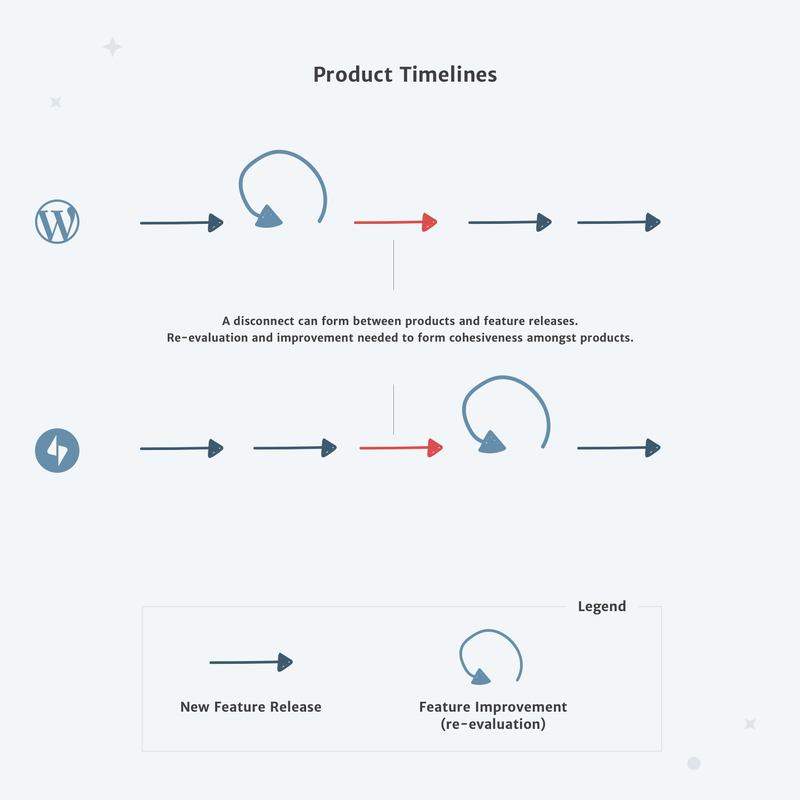 Since the two products often intertwine, a feature may be released for WordPress.com that affects (or doesn’t affect for that matter) sites connected via Jetpack. A flow could break or just not exist—forming a crack in functionality for our users. Being on the Jetpack design team, we need to do our due diligence to ensure our Jetpack users know about AND can utilize new features brought to the WordPress.com world—and thus we re-evaluate feature flows and marketing funnels to prevent any cracks before release. As an example of how we’d treat re-evaluation in the marketing aspect in Jetpack, we can look at the recent release of over 200 premium themes as part of its Professional plan. Aside from the standard marketing push via email and social media to generate awareness of said theme release, we need to analyze where to position specific messaging to let users know that this new feature is available. That means updating calls to action within the plugin like our connection banner and full screen connection prompt, but also within the plugin, after its been connected to WordPress.com. Aside from that, shipping reminder email notices occasionally can also be useful. This way we position feature notices for both potential users along with long-time Jetpack users so no one is overlooked. If a feature exists in a rather large product and users miss the initial announcement, we need to ensure there are other funnels to drive usage of our feature. If a user or potential user doesn’t know a feature exists, how are they supposed to utilize it? As we move forward building more cohesiveness between WordPress.com and Jetpack, it’s important that the marketing also maintains consistency—not just the product. Releasing the same feature for two products but providing different messaging for each would look unprofessional, unrelated, and only ignite confusion. 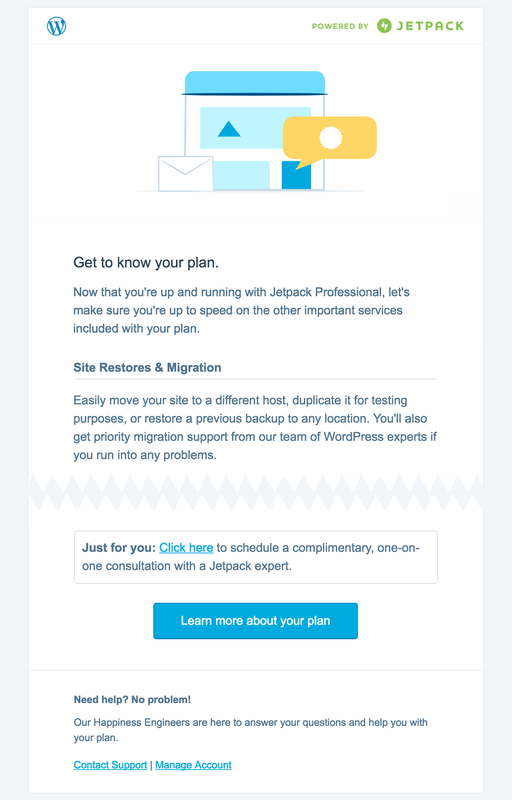 Earlier in the year we made a push to consolidate our email templates for Jetpack customers. In the past, Jetpack used to send many different templates with different designs to users based on the subject of said email. Each template appeared different and were inconsistent with each other—both by visual standards and messaging—it looked chaotic. 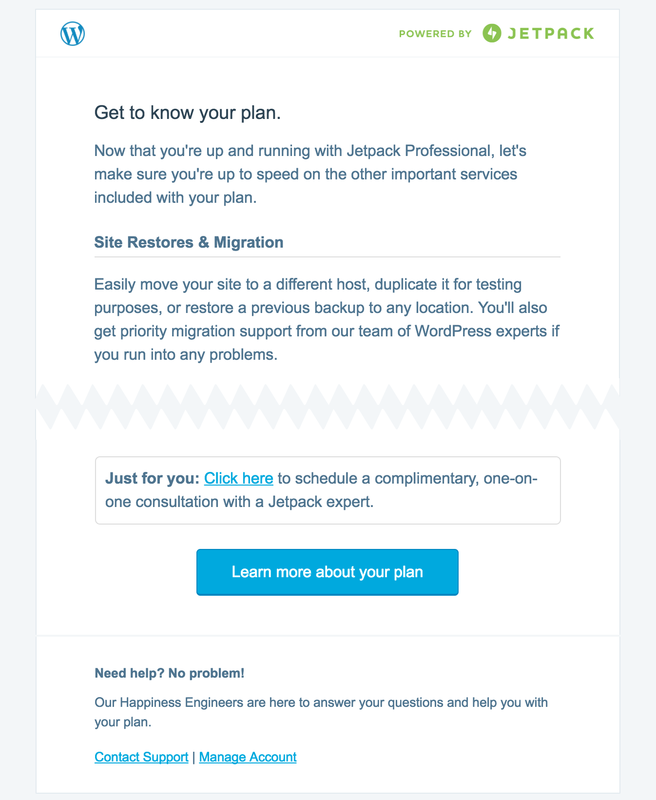 We quickly dispatched said templates and implemented a standard design across all Jetpack emails. Not only were the Jetpack emails consistent with each other, but they were the same templates designed for WordPress.com emails. Since Jetpack users could be WordPress.com users, or vice versa, depending on what type of sites they had or how many sites they had. Now our email correspondence all appears consistent—eliminating any cracks that may disturb our users. For the month of July we re-evaluated these templates for improve them. Since we recently released our inclusive illustration language for WordPress.com, it was only prudent that we carry those visuals over to Jetpack since WordPress.com and Jetpack now share a lot of the same features. With these illustrations now present in our emails and within Jetpack itself, we’ve formed more consistency between our products—making for a more structurally sound road.